Chatroulette is the best random video chat service on internet world. Thousands of online users from all across the world remain online every moment. But due to some reasons, people start looking for Chatroulette alternatives on Google search. Already, we covered list of top omegle alternatives. One reason may be that you would not like to create account for chatting online. Because, now a days you need to create account at chatroulette before start video chatting. Other reason may be, your ip address has banned by Chatroulette. If you have banned from Chatroulette, don't forget to check our post on How to get Unbanned from Chatroulette. 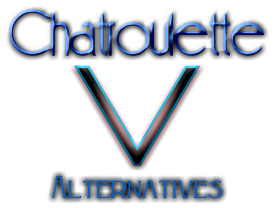 So whatever be the reason, We have collected a list of Chatroulette alternative sites. Below is the list of best five Chatroulette Alternatives. Omegle is the best alternative to Chatroulette.It provides simple text as well as Video chat. You can start random video chatting without any downloads and registration. They have introduced a dorm chat feature recently which let you chat with friends belonging to your college and universities. ImeetZu is a new random video chat service which instantly connect you with random person. You can also create social chat profile like badoo. It provides video chat, text chat and group chat. Funyo is another webcam based social networking website. You can take advantage of social like feature as well as free random chat. ChatRandom is a new fastest growing Chatroulette alternative which let you chat random girls and guys from all around globe. It provides free cam chat, girl chat, gay chat and multi chat rooms. Facebuzz is another random free video chatting service in real time. It has Chatroulette style functions to interact with strangers on webcam. So, these were the list of Chatroulette Alternatives. Also, check big list of sites like omegle. If you know any other interesting video chat website, share with us via comment. As for me, it's much better than all the ones that I see in this ranking!